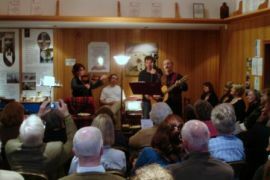 The Cream of Strathbogie — a rich mix of poetry, prose, song and music — thrilled an appreciative audience at Rizza's Ice Cream factory in Huntly on 6th May. 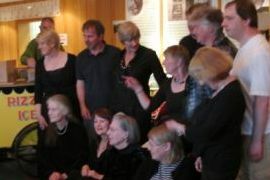 The company of Huntly Writers were totally at ease mixing new stories with old music in a unique setting. The creativity of the Japanese renga, a poetic performance by several of the group, itself a product of one of the Huntly Writers' workshops some months ago, was the highlight. Contributions and performers were all very different and woven together well to release the sheer fun of the evening through connecting riffs from Haworth and poems about ice cream to honour our hosts. Poignant poetry made us think and story telling, both in English and Doric, at times sent chills around the room and then laughter broke out at the absurdity of relationships played out in both poetry and prose.